Once you have measured up and bought your wallpaper paper, lining paper or ceiling paper you will need to hang it, to do this you will need some wallpaper adhesive to stick it to the surface you wish to cover. There are ready mixed and self mix pastes on the market, but which one to use? Some wallpapers recommend using a particular type of paste, this maybe the paper manufacturer’s own brand, a ready mixed paste or just a good quality paste such as a self mix one. 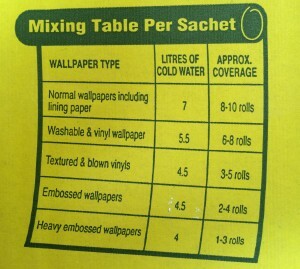 Refer to the wallpaper manufacturers instructions or ask your supplier which paste to use for your paper. Once you have the bucket of water, cut the top off the sachet of paste and stir the water vigorously as you tip the entire sachet of paste into the water. Stir for 20 seconds to allow the paste chips to dissolve, then let it rest for 90 seconds and finally stir once more before using. In this short video I show you how to mix up the perfect wallpaper paste.